About: Union Jack is a pub that serves beers, wines and spirits and has Sky TV showing major sporting events. We dropped in here on spec a few weeks ago and had a great evening. 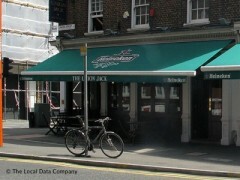 It was comfortable and clean with a decent range of beers and very reasonable food. But best of all, there was a great band playing - the MC Band - playing soul and blues. We'll be back. Went here after work to watch some football and was very surprised having never been here before. Great atmosphere, cool bar staff who make a point to welcome you. Even met a guy from the USA who went here for the first time also and said he waould recommend tohis mates back home. Food was good and place was very clean.